No I haven't forgotten about my Baby Girl Owl Quilt. But I did stop by the Sewing Studio yesterday for some inspiration, and I found some fabric I just had to have!! First, I found the ABC panel. Then I saw the green gears (bottom middle in the picture above) and a red stripe (top right in the picture below). I also used the plaid from the Fun Mischief line instead of the Exciting Mischief line. In addition, I bought a blue swirl from the same designer (only the girl line) (center in the photo below). 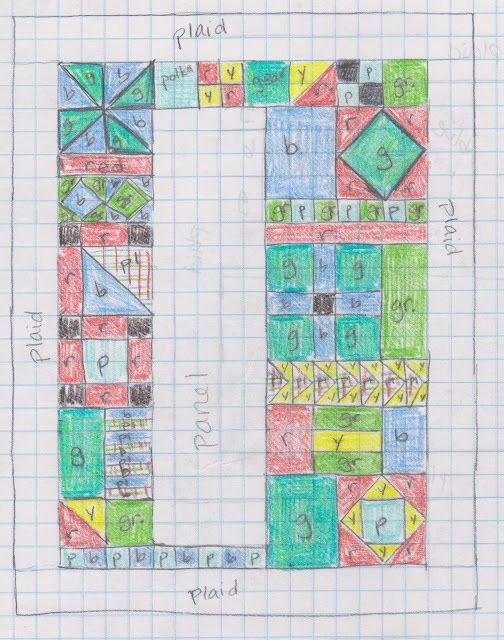 What's really exciting about this project is that I designed the quilt by hand using good old fashioned graph paper and colored pencils. The other exciting part: I used up some of my leftovers from previous quilts to add some color. I used the green and blue polka dot, black and green from the Owl Quilt. And some yellow from a Sock Monkey Quilt I made for a friend. Here's the design I created. It's a random assortment of blocks including pinwheels, diamonds, flying geese, checkerboard, and some others. I can't wait to start piecing it together!